Peshawar BRT caused massive waste of Public money, report. “Havoc has been played with the public money through faulty planning & designing, negligence in execution of work, and poor management of the project,” a 27-page official report on the multi-billion rupees Bus Rapid Transit (BRT) in Peshawar said. The report compiled by the Provincial Inspection Team (PIT) on the orders of the Khyber Pakhtunkhwa chief minister also points to the “shadiness of the affairs at play in the project” causing loss to the public exchequer as “quantities of the items having exorbitant quoted rates have been increased while those having zero rates have been deleted”. The inspection team in its report, submitted to the government on Jan 30, recommended fixing of responsibility for faulty design and execution of work causing loss to the government. Dawn has a copy of the report. Chief Minister Mahmood Khan had publicly announced holding an inquiry into the delay and problems caused on account of the BRT, but officials say no formal orders have been issued thus far to fix responsibility for the faulty design and execution of work. But on Tuesday, the government removed the provincial transport secretary and director general of the Peshawar Development Authority, the head of the BRT executing agency. “We are cognizant of the problems being faced by the people. Chief Minister Mahmood Khan wants to see the project completed as soon as possible,” Mr Yousafzai said in his comments to Dawn. 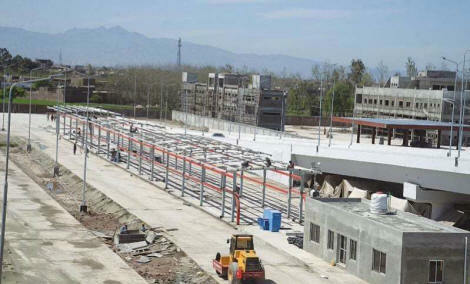 The National Accountability Bureau (NAB) has already submitted its preliminary findings on the Rs67.8 billion mega mass transit system funded by the Asian Development Bank, but the report has been sealed by the Peshawar High Court (PHC), pending completion of the project to avoid further delays in a project that has seen many inauguration dates changed much to the embarrassment of the ruling Pakistan Tehreek-i-Insaf. Construction work on the BRT had commenced in October 2017 and was slated to complete within six months, close to the general elections. The project, however, faced delays, prompting the PHC to order NAB in July last year to look into what it called a “shady and shaky” project. The project was due to be inaugurated again on March 23 this year, but it was put off again due to incomplete work, non-availability of buses and concerns over traffic bottlenecks it has caused. Karan Johar chooses Fawad Khan over SRK!